It’s amazing what a little sweat can do for you when your motivation is waning. Even though I was struggling in the cleansing department this weekend, after a visit to the sauna yesterday afternoon, I’m feeling MUCH better. Thank goodness! And despite our challenging weekend, one of the things I’m loving most about this month is that Austin and I have been able to enjoy more “family style” dinners together–> because he’s actually willing to eat what I’m eating! And we’ve been eating pretty darn well, if I do say so myself. 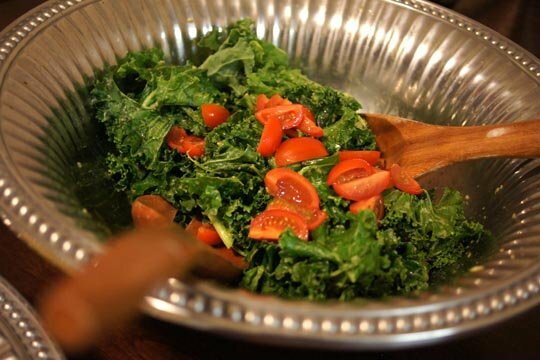 Massaged Kale Salad— dressed with avocado, fresh lime juice, ginger, garlic, Nama Shoyu and stevia. Austin and I are both loving this flavorful combo lately! 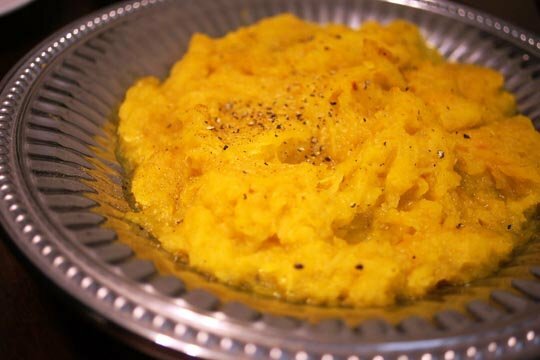 Spaghetti Squash “Noodles” smothered in a Coconut Curry Sauce (very similar to this recipe). 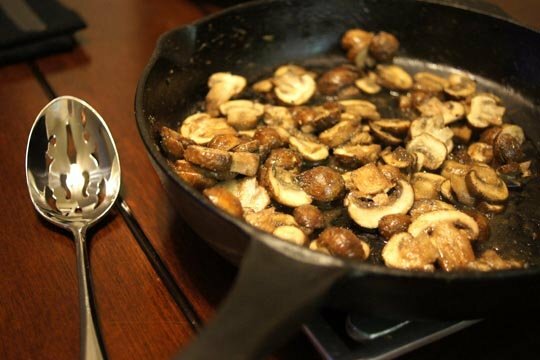 And a skillet full of sauteed Baby Bella mushrooms! Cooked in a touch of grass-fed butter, fresh garlic and salt. So simple, but so good. Dinners like this are so easy when I can simply whip up a huge batch of food, bring it all to the table, and dig in! It’s nice breaking out some of our nice serving dishes for a change, too. Our Armetale dishes have really come in handy for keeping our main dishes hot, and our salads chilled. The only thing we still don’t agree on is dessert. He’s all about the peanut butter blondies, and I’m still loving my chocolate milkshakes! Reader Feedback: Do you enjoy family style meals often? If so, what are your favorite crowd-pleasers? Mmmm I always forget how much I LOVE sauteed mushrooms. That’ s awesome you guys are enjoying meals together! ps..I tagged you in a fun game…11 Random Things…check it out on the blog..thanks for sharing..have a great day! we enjoy making family style meals especially when we are with a group of people. love passing around the plates and bowls of food and enjoying great conversation! oh those mushrooms look amazing!!!! gonna try these soon thx! Yah for you and Austin emjoyimg the same meals. Doesn’t it make life so much easier when you can enjoy the same foods together? Yes, it’s definitely fun having him eat the same things as me! Glad you found me, Ryan! You’re going to have SO MUCH FUN cooking with Doris!! Hey! I wanted to share a photo of cauliflower pizza success! Thank you and Doris! I enjoyed this pizza with my husband for dinner and then had it with some eggs the next day. This is now a go-to dish for sure. Your pizza is so pretty, Lillian!